Mismatch Paint, Check It out! Did you know that stores that sell paint often have a discount section where they sell paints that were mixed incorrectly? These paints are called mismatch paints ( Home Depot calls them ” OOPS! paint”) . You can oftentimes find beautiful colors. I have been very blessed to be able to find colors that were exactly the color I wanted. The trick is to look every time you go to the store. I recommend using a primer over any darker color previously painted on the walls. Colors from underneath can change the way the light reflects off of your new color. 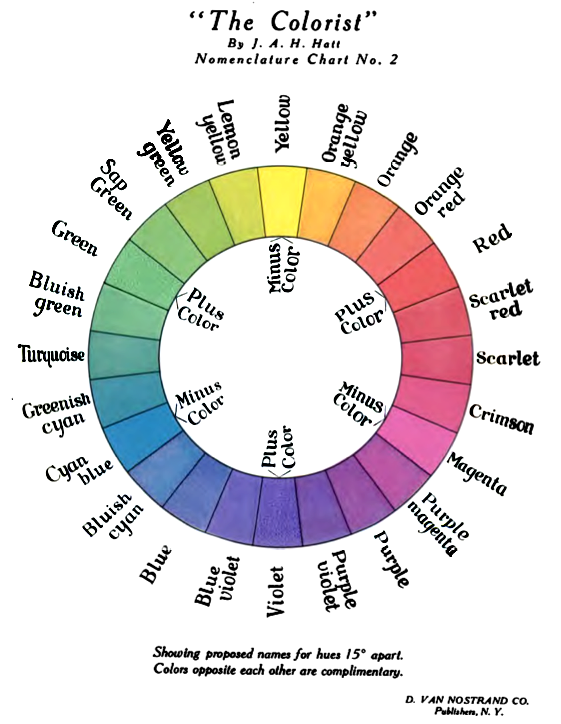 This can cause your new color to look grayed and dull. When painting with a dark color I recommend getting a tinted primer the same color as your paint. Darker paints take more coats to cover your walls any way. But with a tinted primer you should only have to put a layer of primer and one of paint color. With just paint you may have to do 3 or 4 layers to get it to cover well. Also now you can buy “paint & primer” in one, which is even a better idea as it will save you some money in the long run. Again choose colors you love and already surround yourself with. Like the things you are drawn to in the stores, pay attention as you will find that you tend to see some colors more then others. Have you ever been shopping with a friend, looking through a clothing rack? You will have looked at the same rack yet your friend will pull out something really cute that you didn’t even see when you looked through. I do this all the time with my daughter. I have a tendency to see Earth tone and jewel tones. My daughter has a tendency toward pastels and and brights. She finds the cutest things that I never even saw. Of course I wouldn’t look good in them either so I wouldn’t buy them; but they are beautiful colors. 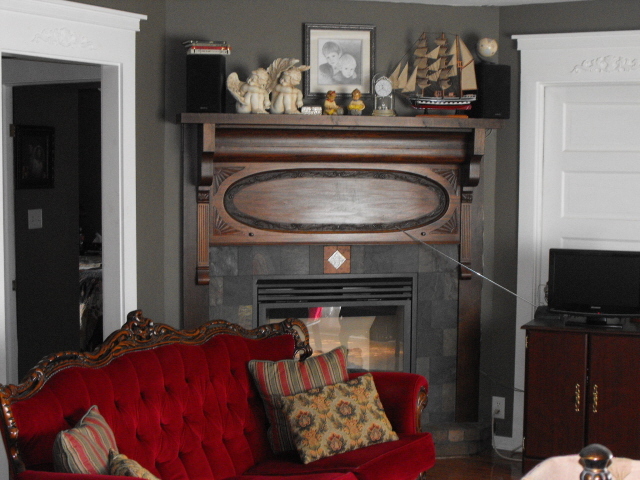 My point is this: sometimes when we are visiting a friend’s house we just love the color they painted their walls. But remember it is a extension of our friend, but not necessarily an extension of you. You will want your home to tell people about you- who you are, how you feel. The colors you choose can do that in subtle ways. As an experiment I would like my readers to look through these pictures from past blogs. What can you tell about me?Just by looking at the pictures of my home; What do the colors I choose, the art work, and the over all feel tell you about me and my family? If you read my blog on a regular basis, please participate! This should be interesting. Now that all the plastering and painting is done it is time to install our new wood flooring. We chose an unfinished wood for our kitchen floor. All the boards were milled to the same thickness so very little sanding was involved. A special tool is needed to nail these hard wood tung and groove boards into place. You hammer on the tool with a rubber mallet and the tool releases a nail when the pressure is at the right amount so the nails always go in at the same depth. If you like doing puzzles you will like laying a wood floor. The boards come in all different lengths. When laying row by row make sure that the ends of the boards in one row do not come with in 6 inches of the end junction of the previous row’s board. 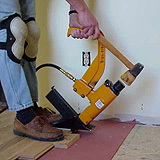 This will help your floor be stronger and less apt to squeak. Once all boards are in place we gave the entire floor a light sanding. Wipe down with a tack cloth, then stain ,and then a polyurethane floor finish can be applied. About 6 coats are needed. Then according to what ever floor finish you use it may be up to 6 days before you can place furniture on it. I recommend a matte finish as it is easier to keep clean looking. 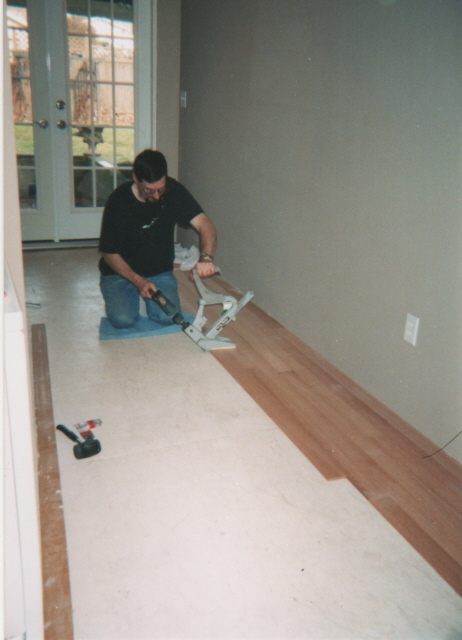 When we put wood flooring in our living room we purchased pre-finished flooring. These are great because you install them and you are done. A couple of days for the installation then you can move in. It beats waiting a week. The only down fall I have found is that most pre-finished wood flooring has a gloss finish. When damp mopping you must wipe up after to keep dried water spots from showing dull spots on the floor. Also the pre-finished boards are slightly beveled on their edge. I guess this is in case the boards are not exactly the same thickness, but dirt can get stuck in the groves created by the bevel. All in all I love both my pre- finished and self-finished wood flooring.